It’s been a busy week! I’ve been trying to pull together the October issue of the Ontario Field Ornithologists’ newsletter, and have been working on a fair bit of moth-related stuff for the book. This has not only kept me from posting much this week, but also kept me from getting outside very much, so I don’t have many photos for the miscellany post this week. I have a few backlogged subjects I hope to get to soon, but in the meantime, here are the handful of “leftover” photos I had. With the cooler weather settling in as we pass the fall equinox, we’re starting to see mist rising over the fields in the morning, and settling in at night. This photo was taken on one such cool evening, as the sun was setting and the dew was falling. It’s a phenomenon I really only see in meadows and over water; I don’t know whether that’s just because large open areas are better for making it visible, or if the mist is caused by it being a large open area. The little “island” in the mist here is a small hummock that was built by the previous owners many years ago. I don’t know what’s underneath the grass or why they built it. After a couple of months of distraction before, during, and following our move, I’ve finally got back into mothing regularly – naturally, now that the weather is turning cool. This week will be too cold to bother, but last week had a few decent nights. 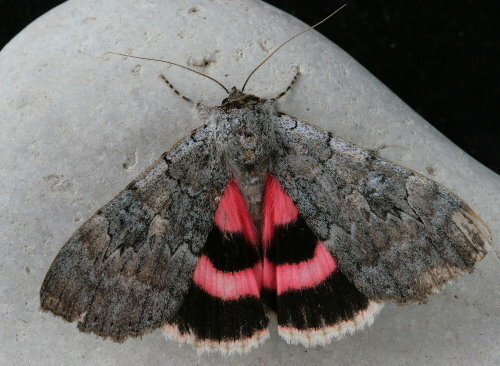 The large flashy moths at this time of year are the underwings, members of the genus Catocala. Most species in this genus have rather drab, wood-grained forewings, and brightly coloured hindwings that give the group their name. The hindwings are usually pink or orange, but sometimes a yellowy colour, or solid black. Many can be tricky to tell apart from each other. This one is a Pink Underwing, one of a few species with pink underwings. Because they’re so large and flashy compared to many moths out at this time of year they’re one of the groups that has been relatively well-documented, along with silk moths and sphinx moths. Although most of the bugs I get to my trap are moths, I do get some other critters. Wasps, beetles, midges, true bugs and daddy-long-legs are regulars. What I don’t see very often – or at all, really – are dragonflies. I nearly stepped on this Green Darner the other morning. Dragonflies are day-fliers, so it would be unusual for one to be out at night to be attracted to the light. I can only think either that this one was roosting in the garden near the light, or it rose before I did in the morning and came to the light before I came out to turn it off (I’m not up at the crack of dawn, so this is in theory possible, though I don’t know if dragonflies would actually do this). 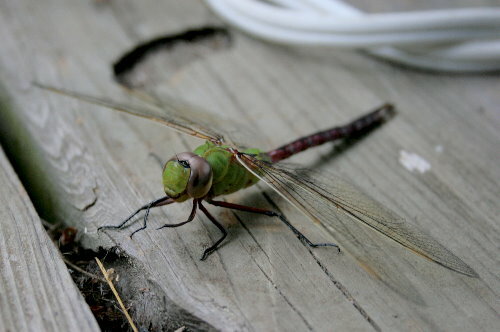 This is a female or immature Green Darner, as told by the colour of the abdomen – adult males have blue “tails”, while those of females and immatures are red. I found this near the trap one morning, too, though I think it was just coincidental that it was nearby. It’s a katydid, perhaps an Oblong-winged Katydid (Amblycorypha oblongifolia) or a related species. 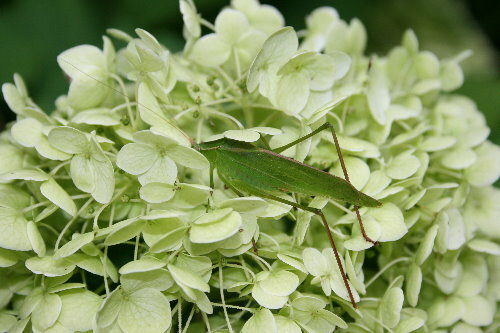 The name comes from members of the genus Pterophylla, the True Katydids, whose call sounds a little like “katy-did, katy-didn’t”; katydids of other genera don’t sound like that. The Amblycorypha includes 14 species in North America. Most are the typical green, but occasionally one will turn up that’s a rather startling bubble-gum pink, like this one photographed by Tom of Ohio Nature. Female katydids have long, thick, curved appendages protruding from the rear of their abdomen (their ovipositors), while males do not; I think this individual is a male. I saw this scene along a sideroad near my parents’ new home. It seems to be a common land-clearing practice out in eastern Ontario, but was something I hadn’t encountered in the Greater Toronto Area when I lived there. I don’t know if this was because of the higher population density in the GTA, or just that land wasn’t used for agriculture as heavily as it is in the east. 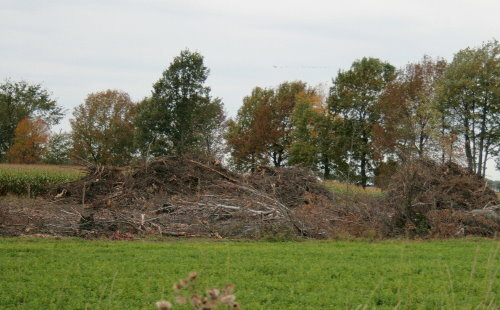 To clear the land for crops farmers will bulldoze the trees and stack all of the leftover brush in huge mounds that they then burn (for scale, that’s corn growing behind the mounds). On the weekend, on the way back from the pink ribbon ride, I passed a couple such controlled burns. I suspect that the large trunks are sold, either for firewood or lumber, and it’s the remaining brush that’s burned, but it seems like a bit of a waste to me. Couldn’t they sell it to someone for mulch or woodchips? Is it really necessary to burn it and release all that carbon into the air? Also on the drive home on the weekend I spotted this version of the “Slow, children playing” sign one often sees around family neighbourhoods. I wonder what exactly they mean by that? 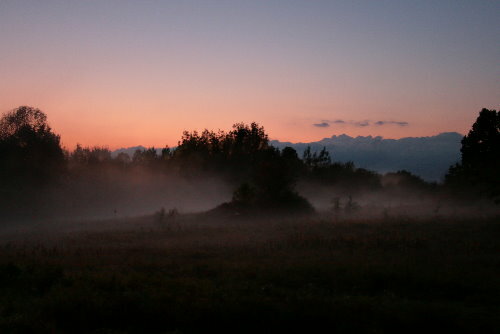 That mist photo is so serene and peaceful. What a beautiful moment. And the sign is interesting. I get the meaning–just another way to say children playing and probably not watching where they’re going–but I don’t think I’ve ever seen it advertised quite that way. I’ve always been an early riser and have been amazed by the amount of dragonfly activity taking place before dawn. I’d say you’re probably right in that the darner woke up before you did and got caught (though I also see a lot of activity through dusk, so it’s also possible it landed there the night before). In either case, the early and late dragonfly activity intrigues me since they technically are diurnal critters. That’s interesting to know regarding the dragonflies, Jason. I haven’t noted that here, but on the other hand, I’m not usually up early enough to notice. The light was on till perhaps a couple of hours after sunrise, so there would’ve been lots of time for them to get flying, particularly ones that spent the night somewhere where the sun would hit first thing. The Pink Hindwing is nicely color-coordinated with the sunrise! That’s true, Ellen! I love the flashes of colour on these guys. Love the sign. 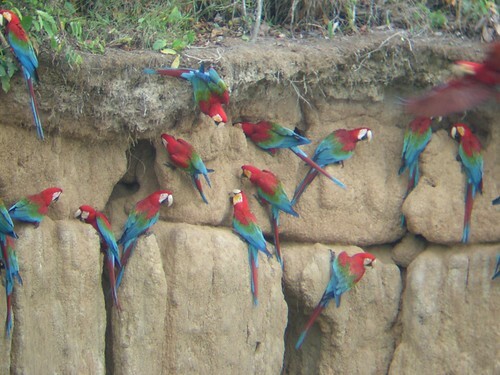 And the Macaws. I actually pulled a U-turn when I spotted it so I could go back to get a photo, something I don’t often do for signs. You know, you really only need to come up with $200 a month from your couch and just save it up. Just start inviting some really rich friends over regularly, like Tuesday night movies, and have them stop at the store to pick up the munchies on the way… Or maybe those same rich friends would be willing to all chip in as next year’s birthday present? Interesting – that katydid appears to possess the broad, leaflike wings of the aforementioned genus, but the pointed head of the Conocephalinae family. Well, I’m officially baffled! 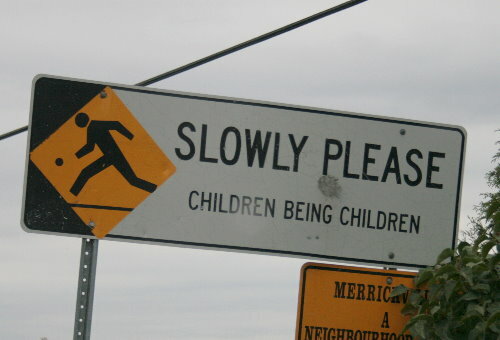 I think that sign is an improvement over the ambiguous “Slow Children Playing” signs that I normally see. Perhaps the darner was attracted to the light as a way to warm itself? In any case, they’re beautiful dragonflies but nasty biters if you have to handle one.